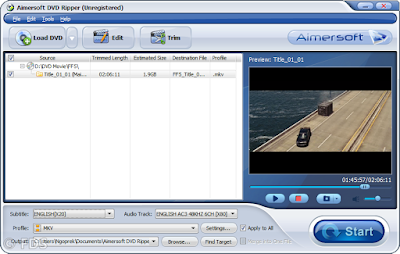 Aimersoft DVD Ripper is a tool to convert DVD movie (folder, ISO, discs) into other video format. On the Aimersoft giveaway, license key for Aimersoft DVD Ripper is 100% free. Save $39.95 by downloading Aimersoft DVD Ripper with genuine license code. Aimersoft DVD Ripper is available for Windows and Mac. Unfortunately, the version given on this offer is windows versions. The vendor not giving away the both versions Aimersoft DVD Ripper license key. The software can convert DVD movie to make it playable on other media players. Just requires three simple steps to convert any DVD using the software, add file, select format and convert. On this offer, available unlimited copy of the software. But you must hurry because its time limited giveaway. If interested, check the giveaway page Aimersoft DVD Ripper. Giveaway page Aimersoft DVD Ripper: visit the giveaway page! For users who interested to get one free copy, follow steps requires describ below. Visit the giveaway page above to get free Aimersoft DVD Ripper license key for free. Then enter your name & valid email on the registration form. Submit the online form and within a few minutes you’ll receive genuine license key and download link installer via email. The registration code is lifetime but like other giveaway, it without free support & upgrade. After free offer or giveaway expires, you can buy the license key with special discount. Use our Aimersoft DVD Ripper coupon code to buy the tool with 25% off discount. Buy Windows version! or Buy Mac version! Coupon discount code above is generated specially for our readers only. Buy Mac or Windows version of the Aimersoft DVD Ripper through our deals links. The giveaway offer is over now. Its full 3 days giveaway activity only. I'll update the info if found new active giveaway for this aimersoft software.